#IEBC : "No commissioners will resign including the CEO and election will continue on 26th October." says Chebukati. - Bana Kenya News, Real African Network Tubanane. Home Nairobi #IEBC : "No commissioners will resign including the CEO and election will continue on 26th October." says Chebukati. #IEBC : "No commissioners will resign including the CEO and election will continue on 26th October." says Chebukati. The IEBC chairman has openly defended his commissioners saying that despite the differences in the commission none of them is going to resign. The Thirdway alliance Dr. Ekuru Aukot demanded that the chairman to resign and other commissioners to in order to have a free, credible and fair election. Chebukati, said to have the toughest job in Kenya, said this on Saturday, noting IEBC is intact despite differences of opinion among commissioners. "There may be differences of opinion but the commission is united and committed to delivering a credible, free and fair elections," he said. "We have not received any other communication from him so we are proceeding with all plans as scheduled." 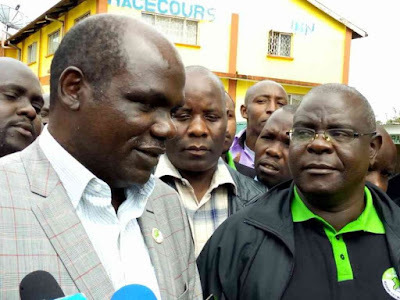 Chebukati said five presidential candidates will be on the ballot because paragraph 71 of the High Court ruling on Ekuro Aukot opened the door for all. He added he does not foresee a situation where NASA blocks elections in its strongholds. "Our mandate is on elections and we are ready in all areas. There are institutions to ensure we do our work smoothly." The NASA leader Raila Odinga will be expected back to the country next week where he will be forced to sign the form 25A for official resignation. According to the IEBC chairman Wafula Chebukati, Raila Odinga did not resign according to the law and he will be on the ballot.